Smoothies are so simple and yet you have to combine just the right ingredients to make a delicious and nutritious one. I personally love a good smoothie especially in the warm summer months…which basically means pretty much year round here in Florida. 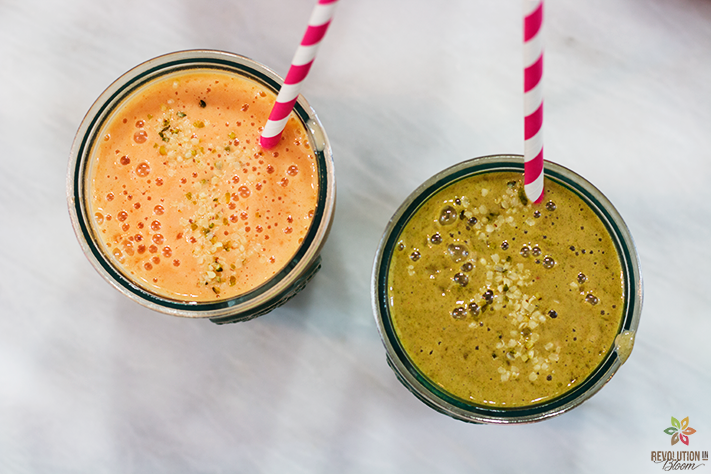 That’s why I decided to share this Superfood Tropical Smoothie with you. It’s packed with healthy nutrients but tastes like a tropical getaway. I also made it two ways, my pink and green version. Sometimes I’m feeling like just a plain fruit smoothie and other times I can benefit from something a bit more jam packed with superfood goodness. You could say I lead a double life when it comes to smoothie making. Another cool thing about smoothies is the use of frozen fruits and even veggies. Frozen produce is a great fall back for getting all of your nutrients in. They last a lot longer and therefore yield less waste. Sure, fresh is considered best but honestly frozen is often just as good. Additionally, another perk about smoothies is their ability to mask ingredients that are good for you but you may not necessarily like to taste. I’m talking greens here. I used a superfood green powder from Amazing Grass in this smoothie, but I’ve also made this smoothie with spinach and kale. Both are equally delicious. That’s because the sweet fruits mask the grassy taste of the greens allowing you to enjoy your drink with all the added benefits of any supergreens like kale and spinach. For an added bonus, I added some extra superfood heavy weights like maca powder and hemp seeds into the mix. I also sweetened it a bit with a couple of drops of Stevia, which is a liquid sweetener derived from plants. You could always use another liquid sweetener though like agave or maple syrup in this as well. 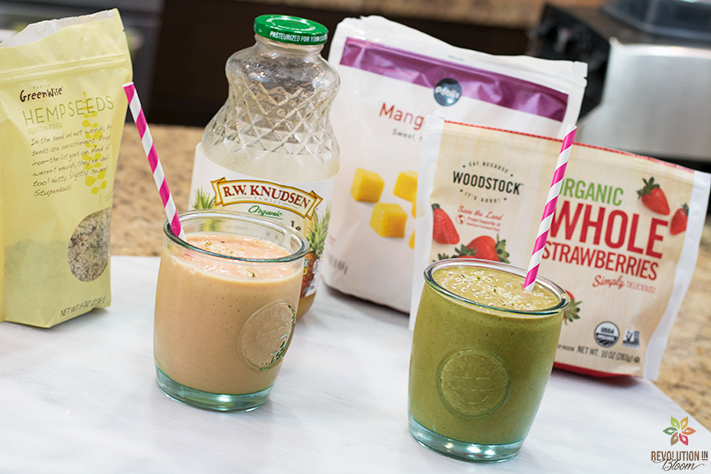 A superfood tropical smoothie made two ways for double the deliciousness! Add all of the base pink version ingredients to your blender and blend (going slowly from low to high) until smoothie is liquefied. Serve immediately. You also have the option of making a whole batch or a half batch of the green version by simply adding the green powder or your fresh greens (kale & spinach) to your pink base. Blend and serve immediately. ENJOY!